When you read the headline it's one of those what-the-heck moments: John McCain has co-sponsored a Senate resolution asking President Obama to posthumously pardon boxer Jack Johnson. 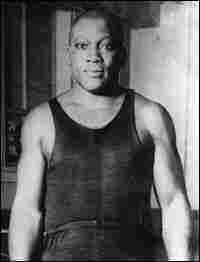 One could find much irony in McCain — having been the great (white) hope of the Republican Party — asking America's first black president to pardon America's first black heavyweight boxing champ who maintained his title after beating the *rap out of "Great White Hope" James J. Jeffries back in 1910. And as was often the case waaaay back in the day, since no individual could put Johnson "in his place," the government stepped in and did the job. In 1913 Johnson, who liked to date — and even marry — white women, was convicted of violating the Mann Act, which prohibited the transportation of women across state lines for "immoral purposes." From the likes of Johnson to actor Charlie Chaplin, the Mann Act was often selectively rather than judiciously applied. And it is that conviction, which Johnson initially fled the country to avoid, that McCain's resolution seeks to set aside. To a degree, as with his late-to-the-party campaign visit to the Edmund Pettus Bridge, McCain is again, well, late to the party. Congress passed a resolution in September urging then-President Bush to pardon Johnson. But though he is apparently quite the boxing fan, having been a pugilist himself, McCain's move is not wholly from the blue. And with the hard work and good intention of those like McCain, eventually a nearly century-old wrong will be righted. Johnson will and should be pardoned. His only crime, after all, was being Jack Johnson, a guy who lived how he pleased; and how he pleased to live was a life of "unforgivable blackness." As time passes, we are all coming to see that such self-assertion is less an offense than a social attribute.